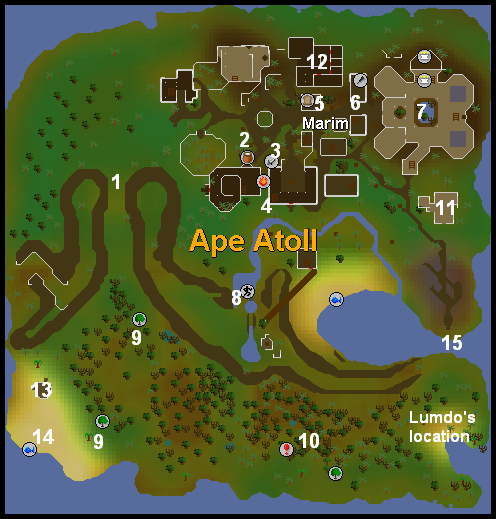 Ape Atoll is a medium sized island located north-east of the Void Knight's Outpost and South of Karamja. Ape Atoll is heavily guarded by Archer Monkeys, and the outskirts of the island is chock full of Jungle Spiders and other nasty critters. 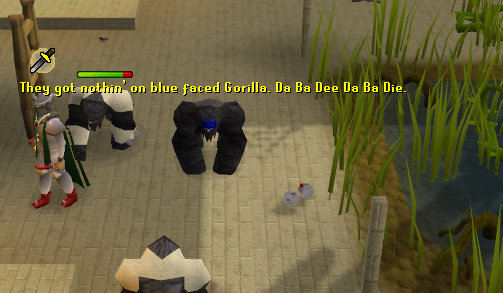 Monkey Madness is required, and if you ever wish to go there without being slain you need to remember a Monkey Greegree. If not, be sure stock up on Anti poison potions and high healing foods! 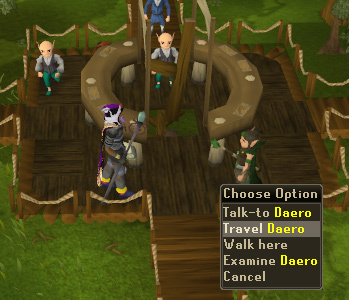 There are two ways to get to Ape Atoll, the first way to get there is by first speaking to Daero, in the Tree Gnome Stronghold tree (Picture below). He will take you into a room lined with gliders. 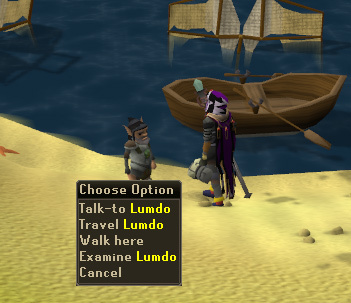 Speak to Waydar, the pilot and ask him to take you to Crash Island, where you will meet another gnome named Lumdo, tell him that you wish to travel to Ape Atoll. The second way, is by teleporting to Ape Atoll. 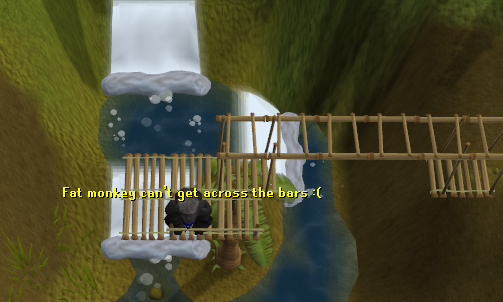 Part 9 of Recipe for Disaster is required, as well as Monkey Madness. 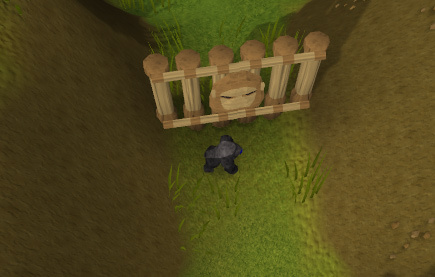 You will be greeted by a small ninja monkey named 'Kruk' when you walk through the gates. 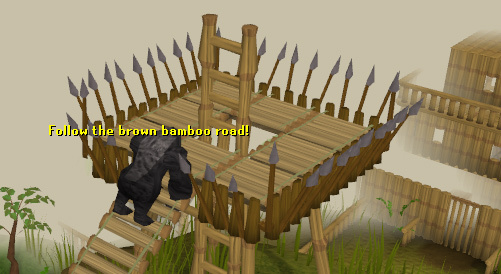 This is the only entrance into the bamboo city of Ape Atoll! 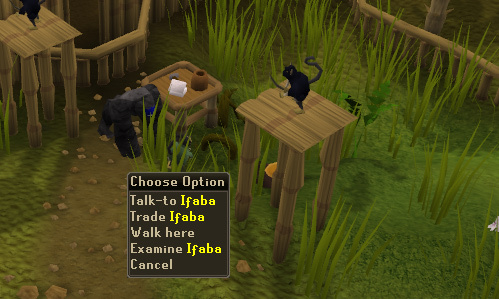 Ifaba runs a small stall located near the center of the bamboo city of apes, where he sells useful items such as ropes, buckets, hammers, etc. This is one of the many stalls that make up this unusual island run by monkeys. 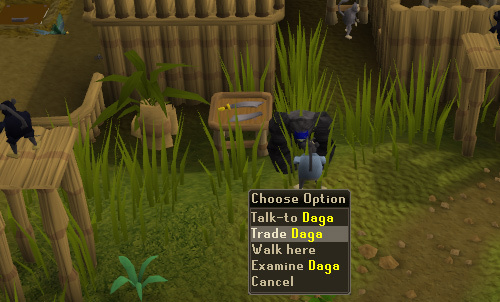 Next to Ifaba's convenient stall, is the stall Daga runs featuring all sorts of scimitars, Iron to Dragon, although Rune and Adamant are not sold here, unfortunately. You could also thieve his stall, like all the other stalls, but try not to get caught! Squeezed between two building, Tutab's stall offers a wide array of runes and other items too, Monkey Dentures and Monkey Talismans, as well as gnome eyes. If you're ever looking for cheap law runes, this is the place to buy them! This is one of two stalls located indoors, also near the center of the city. 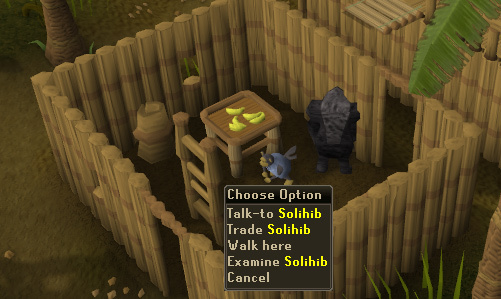 The owner, Solihib, runs a Food stall fit for apes, as it only sells things banana or nut related. 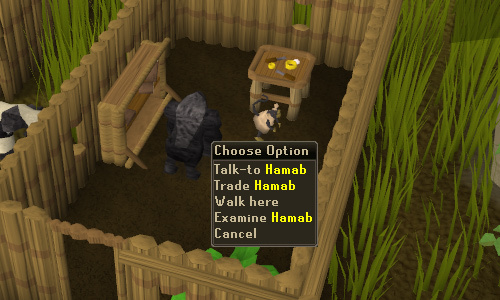 You'll find that Hamab's stall offers a selection of crafting necessities that are useful to the avid crafter, and also sells the 'M'amulet mould', which can make this store a very helpful shack if you ever lose your very own M'amulet mould. 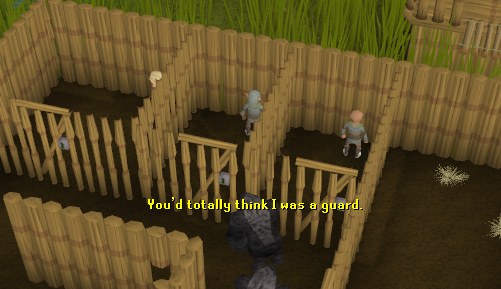 This monastery is filled with level 167 Monkey Guards. 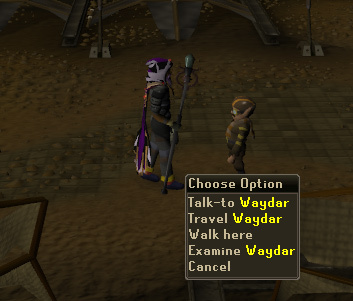 This is a very good place to train your strength, just bring a set of Dharoks, full prayer, and a rock cake. There is an alter, so when you're close to no prayer, just recharge it! This is a fun way to train too, and inexpensive, the only exception being the full set of Dharoks. The Ape Atoll Temple Dungeon is also located down the trapdoor. As one of the best parts of Ape Atoll, this is the primary place to train Agility after level 75, and requires 48 Agility to use the course, the scenery is soothing and at 75+ Agility you will never fail, making your stay more enjoyable! You can find a Mahogany Tree located at each point here, which can come in handy when working on Construction. 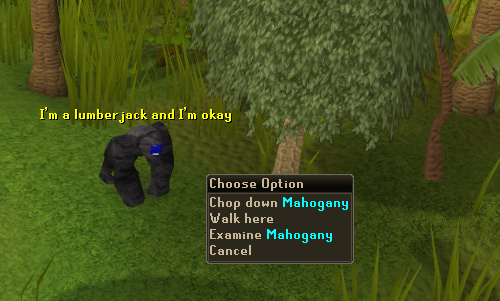 This is one of only a few Mahogany Trees scattered throughout RuneScape. Located directly west of the arrival spot, this dungeon is the one where you meet Zooknook who enchants your Monkey Greegree, so you may transform in the the monkey form chosen. It is filled with dangerous monsters such as Skeletons, zombie monkeys, and other devilish fiends, and rocks that fall from the ceiling! Although none of the monsters can do as much as touch you in monkey form, the boulders can damage you, and energy potions are strongly advised to people that do not have the ability to transform into a monkey. The palace where the great king Awogwei lives, and is constantly advised by two other monkeys of high stature, Murywoi and Uwogo. 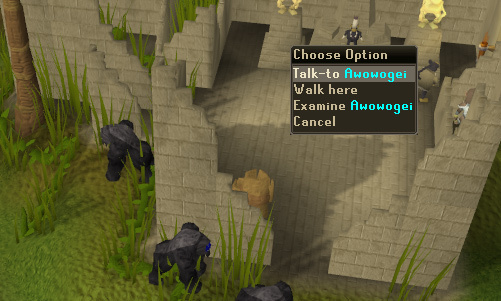 Of course, Awogwei being a very important person he is, Two Elder Guards keep watch, and you don't want to anger them! If you are shot down at any time by the Ninja guards, you will be taken here, and you will be watched constantly, with one of the Guards strolling down the hall, so if you want to get out in time, you have to time it just right! 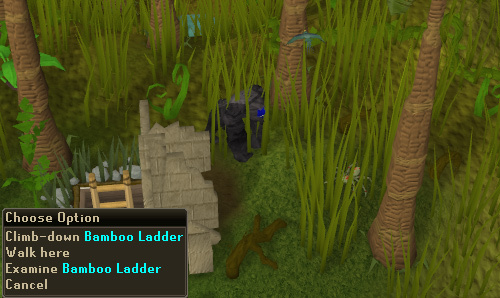 North of the fishing spot, and north-east of the Mahogany Tree, there is a small shack where planks respawn. 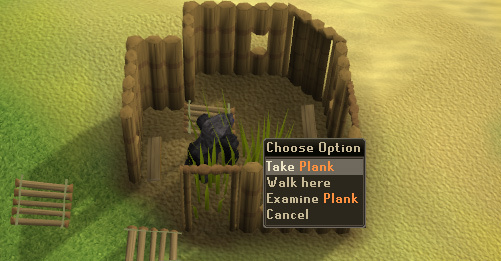 For a beginner at Construction, this can be useful as not only one plank respawns here, but two. The actual fishing spot may differ, but is usually a bit of distance from the fishing icon on the map. Sharks can be fished here, along with Bass. This is not a very good fishing spot, considering it's so far from a bank. 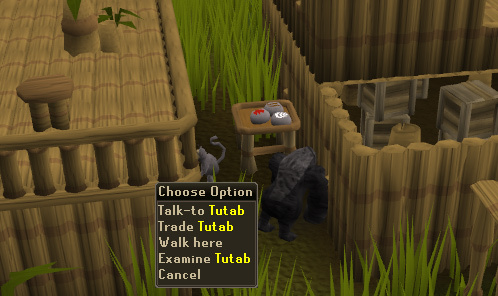 Now only if they made a Ape Atoll bank? At the base is a bamboo ladder leading onto a bridge made of bamboo also. This bridge leads from Ape Atoll city to the Ape Atoll island. This is the only exit out of Ape Atoll other than the main gate. They are good to train on, just use the Protect from Melee prayer, and when you prayer get's low, recharge it at the alter. Dharoks is especially good here. For those who do not know, Dharoks is a kind of barrows armor, the lower your Life Points, the higher you hit. And you would not die, because you could constantly keep up your prayer. If you don't kill these fast enough, they'll beat their chests and regain health! So watch out for that and always keep a sharp eye on you're prayer and health. Small spiders also roam the area constantly attacking you, thus poisoning you as well, you could carry antipoison potions, superantipoison potions, or you may use the Prayer Book from The Great Brain Robbery. This guy wields two scimitar-like weapons, and their bones are hard to earn, since they are in the center of the city, surrounded by archer monkeys ready to strike. These drop medium sized monkey bones. These monkeys are lethal, as they fire upon anything that is not a monkey, and may take you to their prison. These are also tricky to kill, but it can be done. These drop small monkey bones. These are also deadly, and can poison you. They can also hit for up to 45 Life Points. These aren't bound to hit you very hard, like the Scorpions, but can poison you. The higher leveled Jungle Spider version of these guys are pretty dangerous, and also poison. These are pretty dangerous, and hit pretty hard. Their bones are easy to get though, unlike that of the Archer Monkeys or Padulah's. He is the largest of the Ninja monkeys, he duel-wields two scimitars and stands guard of Ape Atoll. This NPC can't be attacked, thus he drops no bones.